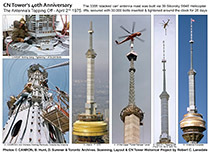 The CN Tower, of Toronto Canada, was considered the "7th Engineering Wonder of the New World". 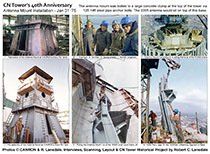 Over 1537 workers toiled around the clock for 5 years in the early 1970s to bring this engineering marvel to completion. There were no precedents nor "rule books" about how to design & build the (then) tallest free-standing structure in the world (1815 feet). Many ground breaking architectural engineering advancements were made, primarily by Canadians. Yet, for the next 40 years, these people were generally ignored, forgotten and swept under the rug. 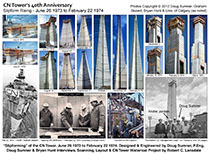 The long term focus of this historical project is to bring due recognition to all the people who built the tower and to rebuild a proper "modern, high quality" visual & textual history of the tower's design & construction timeline. 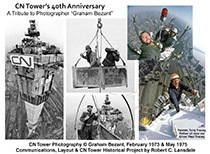 Unlike today's large engineering or architectural projects which are documented openly to the public via social media, newspapers, magazines and TV documentaries, the CN Tower was generally built in isolation from the media and the Canadian public. This ongoing project will rewind time to 1972 and present its history as if there were DSLR-quality colour cameras & weekly social media coverage available in that era. 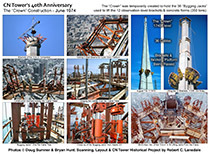 The final project, including the biographies and histories of each main CN Tower person, will be released over time to coincide with the tower's 45th and 50th anniversaries. This WEB page only serves as a spring board to existing, online aspects of this project. As homage to another similar Canadian endeavour, please visit the historical archive of Expo '67 curated by John Whelan. 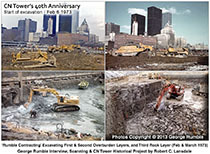 You may also be interested in the similar historical project about the original World Trade Center and its replacement WTC-1. The primary and overarching argument for this project is that every major country has its own cherished engineering & architectural landmarks. For example, England has the Tower Bridge; France has the Eiffel Tower; the USA has the Hoover Dam, the recently rebuilt WTC-1 (the "Freedom" tower) and the prior NYC Twin Towers. Over time these have all been fully documented in books and TV shows. But not in Canada. That's just not what Canadians do! Coming on the heels of our British heritage, Canadians tend to be complacent, indifferent, self-effacing and overly modest. It has been said that "Before Canadians will believe that something is great, they require confirmation by other nations, especially Americans". And since the CN Tower was not built in America, it never did gain that global public respect. 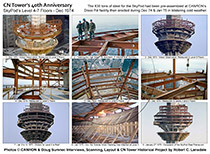 Recreate the tower's design & construction history as if it were being done today. 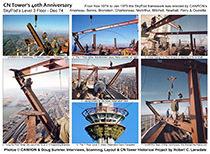 Bring due recognition to the people who came to work on the tower - many have felt 'cast aside & ignored'. Capture a compendium of history for future generations of Canadians to look back upon (especially considering that the CN Tower has an expected life span of 300 years). 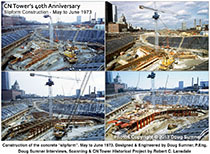 The first of three phases of the project was to rebuild a visual timeline of the CN Tower's construction process, from December 1972 through to completion in 1976. 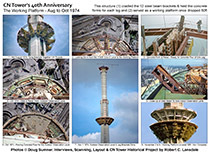 The 22 collages were released upon each construction milestone, 40 years after the fact, to Toronto's social media networks between 2013 and 2016. You can view the full sequence of collages online by clicking here. 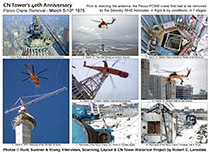 Please make sure to read the descriptive text under each image, especially in the latter half of the sequence which has a number of interesting anecdotes and stories from the original CN Tower people. 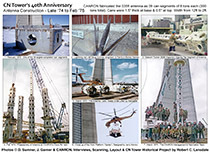 Photo 1: Top row, left to right: Gerry Morrow (CANRON engineer), Albert Ting (CANRON engineer) and Tony Di Giovanni (worked on the CN Tower along with his labour foreman brother Danny). 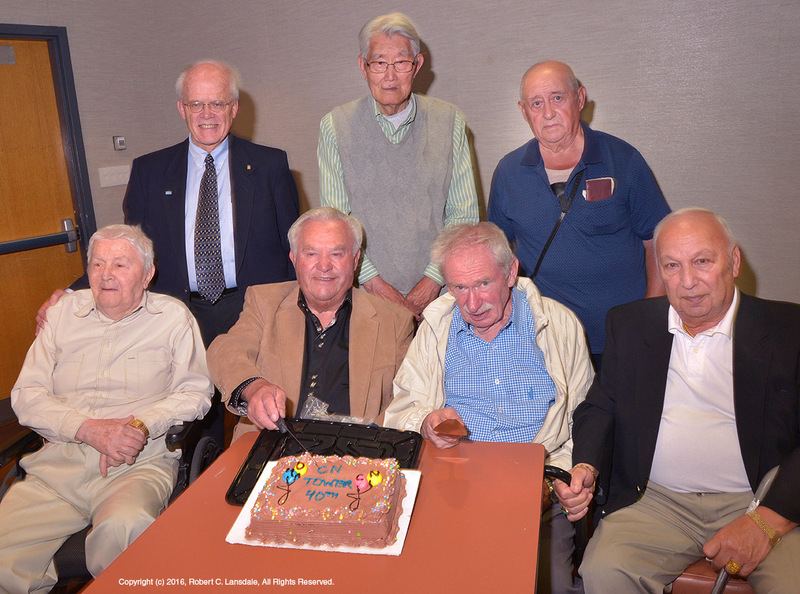 Bottom row, left to right: Dr. Eli Robinsky (91, UofT professor and civil engineer. 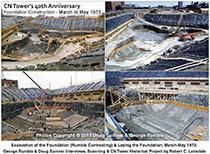 He ventured 150ft down 30" pipes in 1971-72 to investigate the foundation and risk his life in the process), George Rumble (he and his company excavated the CN Tower's foundation, 1972-1974), Andre Jordan (Foundation Co., overall project manager for the CN Tower, 1971-1976), Bob Bronstein (CANRON, site supervisor of the SkyPod, antenna and other 1974-1976 steel erection work). 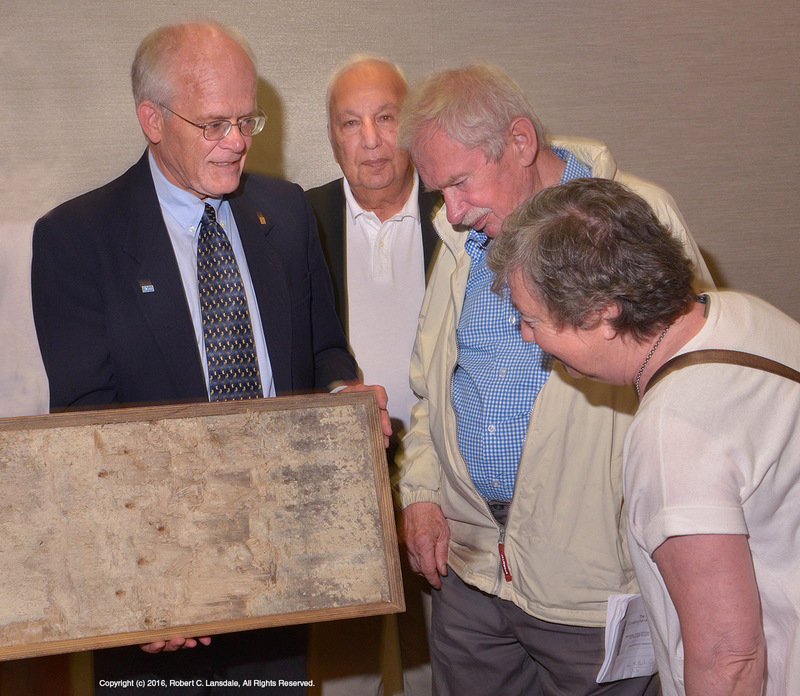 Photo 2: Gerry Morrow (CANRON) showing off a portion of the CN Tower's original slipform plywood which was used to form the tower's shaft (June 1973 to March 1974). The framed fragment provided by Andre Jordan. Left to right = Gerry Morrow, Bob Bronstein, Andre Jordan and Eli Robinsky's wife Marisha. As this presentation and its imagery content is copyrighted, it is not entirely available for online viewing nor redistribution at this time (the following are small snapshots of the images from the slideshow). Rather, 22 of the 100 slides have been selectively chosen from that presentation and made available online. Please click on any image below or click here. A short textual description is also provided along with each of the slides. 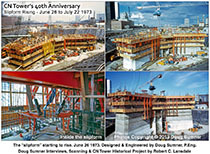 They will provide you a cursory and (very much) simplified overview of the primary people who came to design, manage and build the CN Tower between 1971 and 1976. 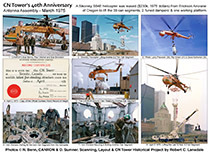 These 22 slides were chosen to primarily reference the people and not so much the construction process, as the latter 78 slides will be reserved for public presentations of this material and/or future published works. 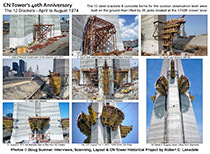 If your local Professional Engineers of Ontario or professional architects group would like to sponsor a talk then please contact CNTowerHistory@gmail.com.